At Chestnut Family Dental, we’re proud to help patients throughout the Manchester, NH area achieves gorgeous smiles through quality dental treatments. While we offer a wide range of treatment options for patients that need to repair or replace teeth, dental implants are one of the most effective, long-lasting, and reliable methods for replacing a tooth. Whether you need to replace one tooth, multiple teeth, or even an entire dental arch, implants offer one of the best all-around solutions. Dental implants are a convenient, long-term solution for replacing damaged or missing teeth. A dental implants is composed of two components: the implant itself, which is essentially a screw-like titanium post, and a crown made from porcelain or a tooth-colored composite material. 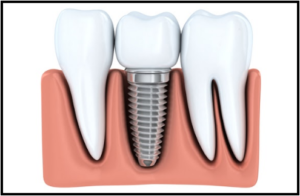 The implant is placed into the socket left by a missing or replaced tooth, then covered with a temporary crown as it heals. Once the gums completely heal around the implant, a permanent crown is fixed onto the implant. With proper care and oral hygiene, a dental implant can last a lifetime, providing a long-term solution for repairing your smile. Long-Lasting: With proper oral hygiene and care, a dental implant can last the rest of your life. They don’t decay like natural teeth, so they truly can last a lifetime. A Strong Foundation: Part of what makes implants so effective is their unique property of osseointegration. Once inserted into the jaw, the titanium post of the implant will literally fuse with the jawbone. This allows bite pressure to be dispersed evenly throughout the jaw in the same way that a natural tooth does, both providing a strong foundation for the implant and helping to prevent bone loss. Natural Looking: We can custom shape and color-match your implant to fit with the rest of your teeth, providing a complete, cohesive, and natural-looking smile. Versatile Treatment: Implants can be used to replace a single tooth, multiple teeth, or an entire dental arch, making them a very flexible treatment option. Implants offer one of the most powerful options available for repairing or replacing teeth – and if you’re interested in learning more, we’d love to help. Contact us today to learn more about how dental implants can improve your smile and to schedule a consultation with us. We can’t wait to help you achieve a beautiful new smile through dental implants!